A convoy of Iraqi military vehicles heads toward Qayyarah base in northern Iraq, ahead of an expected offensive to retake Mosul from Islamic State militants, Oct. 15, 2016. Iraqi Prime Minister Haider al-Abadi has announced the formal start of a military push to drive Islamic State extremists from the northern stronghold city of Mosul. The announcement on state television early Monday signals the opening of the largest military operation in that country since U.S. forces left five years ago. U.S. Defense Secretary Ash Carter said this is a "decisive moment" in the campaign to defeat Islamic State and pledged support from the U.S.-led coalition. "We are confident our Iraq partners will prevail against our common enemy and free Mosul and the rest of Iraq from ISIL's hatred and brutality," he said in a statement. In the hours before the announcement, the Iraqi Air Force dropped thousands of leaflets on Mosul, warning residents of the coming offensive to liberate the city. The leaflet drop followed hours of an artillery shelling by Iraqi and Kurdish forces, and sparked widespread confusion over whether the full-scale assault on the country’s second largest city had already begun. The confusion over whether the offensive had begun in earnest highlighted the ethnic and religious rivalries of the fragile anti-IS coalition that have plagued the planning for the assault. Some analysts fear those rivalries could undermine the military campaign and prompt infighting later over control of the city and its wider region after IS has been ejected. This U.N. map shows expected paths of escape from Mosul. For weeks, the assault on Mosul has been expected, but disagreements have flared between coalition allies over how the greater Mosul region of Nineveh will be governed after liberation and who should be involved in the fight to get rid of IS. Kurdish claims earlier this month that any territory the Kurdish peshmerga capture will remain part of Kurdistan have infuriated the Shi’ite-dominated government in Baghdad. On Saturday, Turkish President Recep Tayyip Erdogan rebuffed once again demands by Iraqi Prime Minister Abadi to withdraw about 2,000 Turkish "military advisers" from a base 20 kilometers from Mosul where they have been training local Sunni fighters in a militia called Hashd al-Watani. Erdogan has insisted Mosul should be controlled by Sunni Muslims, and along with local Sunnis he has warned Shi’ite militias to stay out of Mosul. Iraq's elite counterterrorism forces gather ahead of an operation to retake the Islamic State-held city of Mosul, outside Irbil, Iraq, Oct. 15, 2016. West and east Mosul were pummeled by an artillery bombardment Saturday. 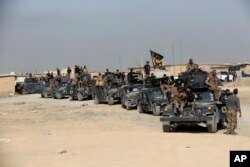 A round of airstrikes also hit the city as Iraqi special forces deployed in Mosul's suburbs. Analysts and observers on the ground said it looked as if Iraqi forces with the support of Kurdish peshmerga and Shi’ite militias would strike from three different directions into the city, which IS seized in June 2014 and is now the extremist group’s last major urban stronghold in Iraq. IS posted online Sunday photographs it says showed clashes in the Refaq and al Masarif districts of Mosul. Some of the bombardment salvos targeting IS positions in the city were fired by the U.S. military, Turkey’s state-run Anadolu Agency claimed. 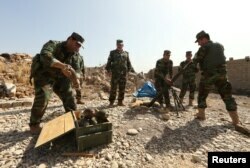 The agency quoted peshmerga commander Omer Huseyin, who said American howitzers based 20 kilometers from Mosul had opened up on IS positions and that U.S. and French warplanes had mounted sorties. Peshmerga forces gather on the outskirt of Mosul during preparations to attack Mosul, Iraq, Oct.15, 2016. In response, “Daesh (IS) terrorists started burning tires to block the view of the warplanes after international coalition forces struck the area,” Huseyin said. “Daesh terrorists also started burning the petroleum filled in their ditches, which they have dug around the city,” he added. On roads controlled by Iraqi and peshmerga forces leading to Mosul, there were reports Sunday of columns of artillery and heavy weaponry heading to the fronts. 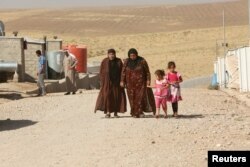 The leaflets dropped by Iraqi planes on the city said the offensive to retake the city was imminent. “It's victory time," read one of the leaflets. “Time to celebrate a clean Iraq without "Daesh" or any dark belief.” Humanitarian workers, though, say it is unclear what Mosul civilians are meant to do. They have criticized war planners for failing to mark out clear escape routes for civilians. The four-page leaflets urge civilians not to panic, to avoid IS positions and to remain in their homes and seal windows and doors. A phone number to report jihadist activity is included. Displaced people, who fled Mosul, are living at a refugee camp in Duhok, Iraq, Oct. 16, 2016. The U.N. refugee agency, UNHCR, has warned of a looming humanitarian disaster and predicts more than one million people could flee Mosul during the battle. So far six refugee camps able to shelter 50,000 people have been built and there are plans to establish another 11. Mosul residents contacted by phone and Skype say IS fighters, many veterans from battles in neighboring Anbar province, have blocked major roads and bridges in and out of Mosul. The jihadists have fanned out throughout the city and planted mines and explosives and warned civilians not to attempt to leave.